Just nine days after fleeing the course mid-round in consternation with his game, the 23-year old world number one surprised even himself with his ability to rise from the depths of despair with a truly great final round that catapulted him into a share of eighth behind winner Tiger Woods on 10 under par. “Youth has the resilience to absorb disaster and weave it into the pattern of its life, no matter how anguishing the thorn that penetrates its flesh,” wrote the American-Jewish novelist Sholem Asch. Highbrow as that sounds, it means pretty much the same as the sentiment expressed by Doral’s flashy new owner, billionaire Donald Trump, when he greeted McIlroy at the finish. McIlroy fired an eagle and five birdies in a sensational closing round, hitting 10 of 14 fairways and missing just three greens on a blustery day that saw Padraig Harrington shoot a 72 to finish tied for 39th on level par. It was a stunning turnaround for the 23-year old from Holywood who proved for the third time in as many years that you write him off at your peril. Just days after confessing that he wasn’t in “a good place mentally”, the Northern Irishman followed a 73 with rounds of 69, 71 and 65 to finish inside the top 10 as Woods closed out his 76th career win by two strokes from Steve Stricker on 19 under par. Graeme McDowell was furious to make a double bogey six at the 18th for 72 that denied him solo third place and cost him $172,500 and a huge handful of world ranking points. In the end he had to settle for joint third with Adam Scott, Sergio Garcia and Phil Mickelson and ‘just’ $417,00. After carding two eagles and 20 birdies in four days, McIlroy said: “I feel a lot better after that. Regardless of the score I feel like I hit a lot of good shots over the last three days and I’m really happy with where my game is at compared to where it was at the start of the week. “I feel like there is still quite a bit to go but scores like that today and shots like I’ve hit over the last three days definitely give me confidence. “I just limited my mistakes because I have made a lot of birdies and eagles over the last three days but list made a lot of bogeys too. It was just limiting the mistakes and playing smart at times too and that’s what I did today. “It was very solid, no mistakes and drove the ball really well. I am feeling good going to the Masters, not as good as I could be but better than I was at the start of the week. I am excited about my game. “It’s heading in the right direction and I now have a couple of weeks before Houston and then Augusta,” he said. Despite the resurgence in his game after such an erratic start to the year, it is a testament to McIlroy’s single-mindedness will not be adding events to his schedule ahead of the Masters. 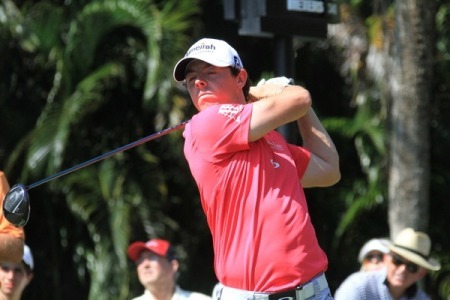 Rory McIlroy hits an iron shot in the final round at Doral. Picture: Fran Caffrey / www.golffile.ieHe could have entered this week’s Transitions Championship but he has also resisted the temptation to play at Bay Hill, no doubt because it clashes with Caroline Wozniacki’s visit to Miami for an WTA event. Tied for 50th after his opening 73, McIlroy was 32nd after Friday’s crucial 69 and 30th following his Saturday 71. He admitted before the final round that his confidence was “as low as it has ever been” when he arrived in Miami on Tuesday night. But he says he has learnt that like the rest of us, he must be more patient in future. Surprised how quickly he was able to turn his game around he said: “A day like today felt like a long way away if I’m honest. Just goes to show, it’s never as far away as you think. That’s been one of my problems. “I always think when I’m playing bad that it’s further away than it is and I guess that’s just where I have to stay patient, and you know, let whatever happens, happens. He cut a swathe through the field on a blustery final day when he opened with a stunning eagle three, reducing the par-five first to a drive, a 191-yard seven iron and a 20 foot putt. He then birdied the fifth from 15 feet to go out in 33, sprinkling his opening nine with a handful of par saves that reflected the improvements he has made in his short game since he started his season with a missed cut in Abu Dhabi, a first round defeat to Shane Lowry in the WGC-Accenture Match Play and that forgettable display in Palm Beach Gardens. He then started for home with birdies at the 10th and 11th and then followed up with another brace at the 16th and 17th in a round featuring just 27 putts. The key to his turnaround was the range session he had on Thursday night and while he is still not playing “unconscious” golf, he’s looking forward to working on his game over the next three weeks before he has his final warm up for the Masters in the Shell Houston Open. Harrington wasn’t in the least bit surprised to hear that McIlroy was going well as he headed for the airport and a 24-hour trip via London to Bankok for this week’s Thailand Open and next week’s Malaysian Open. “Rory? He’s pretty good, that’s why he’s world number one,” Harrington said. Four under after nine holes, Harrington dropped four shots in the last five in his first event wearing glasses but headed east in high spirits. Rory McIlroy will go to the Masters as a stronger player despite his weekend disappointment in the WGC-CA Championship at Doral’s Blue Monster. Rory McIlroy was smiing again during the third round at Doral. Fran Caffrey / www.golffile.ieWorld number one Rory McIlroy insists his confidence is on the rise again after reaching its lowest ebb “ever” following a stuttering start to the season and that shocking Honda Classic meltdown 10 days ago.